The Experienced Travelers can authoritatively state that a crisp côtes du rhône on a sun-filled cafe terrace in the Place Saint-André des Arts is the recommended treatment for cobblestone-worn feet. And a carafe is even better. Associate ET Melinda and I had five fantastic days in Paris, while Nurse enthusiastically directed our activities from home base. Melinda is every bit her mother’s daughter, and having her along was like Virtual Nurse throughout the trip. St. Agricola of Avignon, the French patron saint of good weather, smiled on us with buckets of warm sun. 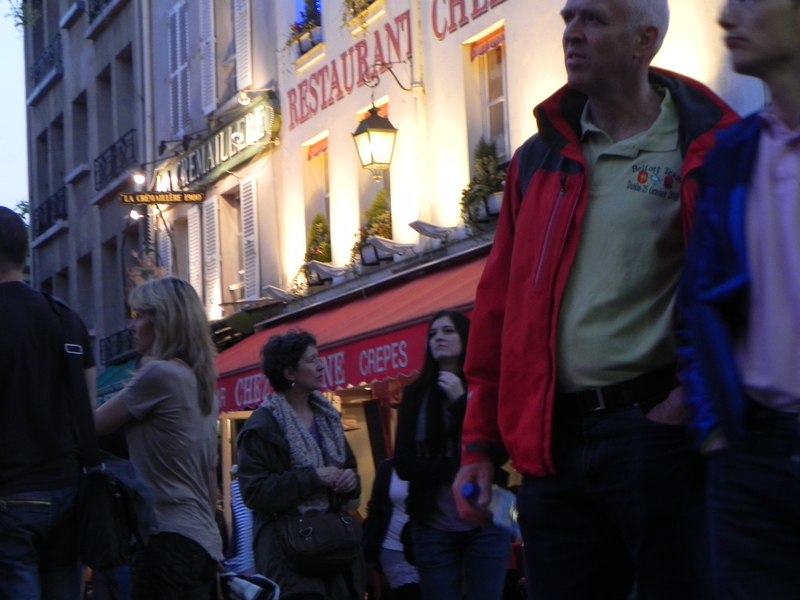 Thus the Parisians were in good spirits, and well-disposed toward tourists like us who leaked euros wherever they went. Adding to the climate, Melinda’s glowing Texas charm melted the cool French demeanor and raised our cachet all across town. We went everywhere (one of us in stylish wedgie sandals) and photographed like mad. Nurse carefully monitored our pictures via Dropbox to make sure they were perfect for the Readership. Under strict direction from Nurse’s texts (what r u eating?) we documented every meal, so there are several scrumptious posts in our future! Melinda claims I am a travel taskmaster, but that just isn’t true! It’s perfectly reasonable that, on our jet-lagged day, we breakfasted on the Rue Cler and tried the first macaron in our Taste Test, hit the Bon Marché food hall, shopped the rue de Sèvres and visited the chic new Hermes store, stopped for a pick-me-up and people-watching at the Café Flore and explored the rue Montgoreuil market for the second macaron in our Taste Test at Strohrer. After a short metro ride, we genuflected before E. Dehillerin and bought lovely new knives, tried fresh oysters and a crisp vintage at Au Pied du Cochon, passed the construction site over Les Halles, made our way to happy hour at a faux-Mexican bar on the rue de Bucci and had a light dinner of an omlette and a chevre chaud salad (with wine, n’est pas) at the Café Danton. Taskmaster? Moi? Over the next four days, we had Paris at our feet – which we would have realized if we had any feeling left in them. Early on, we ordered wine at every opportunity. By the end of Day 1, we consumed 14 glasses between us. By mid-day 2, we invoked emergency ET legislation requiring us to drink Perrier every other round. Yet by the time we dined in Montmartre that evening, we passed an amendment suspending the Perrier rule after sundown. As we toasted the throng in the Place du Tertre, the portrait artists lured willing subjects and the lady inside warbled Piaf songs to a piano accompaniment. Exquisite. 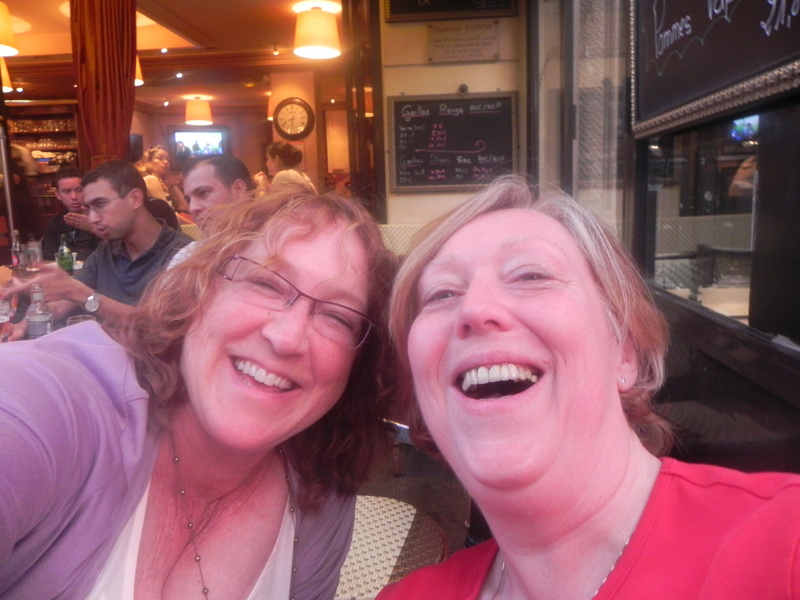 Watch for more reports on our Parisian sojourn in future posts! 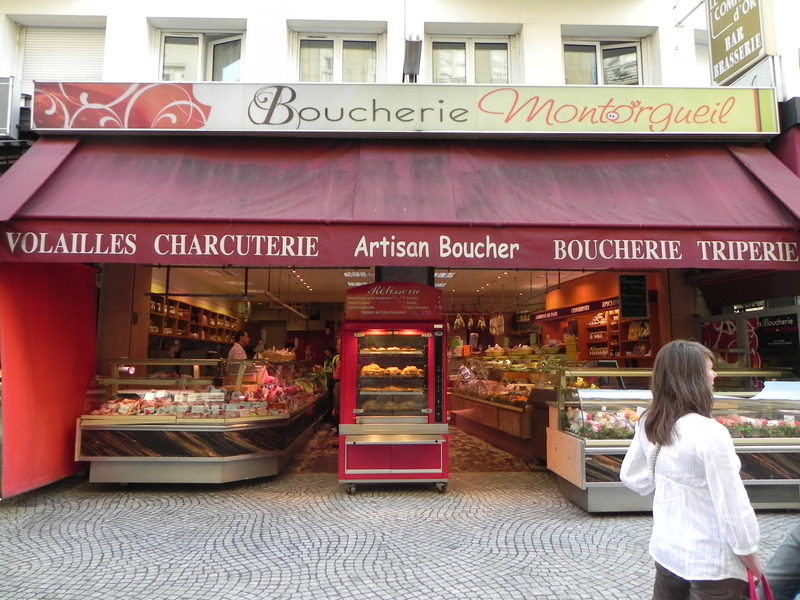 This entry was posted on April 15, 2011 at 9:40 pm and is filed under Montmartre, Paris Cafes, Paris sightseeing. You can follow any responses to this entry through the RSS 2.0 feed. You can leave a response, or trackback from your own site. Tim I took 600 pics just for you! It was a fun trip and Nurse was right on top of things from Command Central. More food – I promise! Julie, you are born to be a travel writer! I can taste the delectable menu selections, while longing for just one sip of wine in the sofftly lighted cafe. I can feel the texture of those wonderful cobblestone streets. I enjoy the perfect mix of personal information: serendipitous findings, temptations succumbed to, moment to moment reports, new friends made and the perfect picture inserted to light up the computer screen and take us with you. Thanks for letting us share the adventure and the fun! Judy thanks so much for your generous comments! Knowing that I get to report on the trip makes it more fun while it’s happening – and I have a perfect excuse for all that wine! 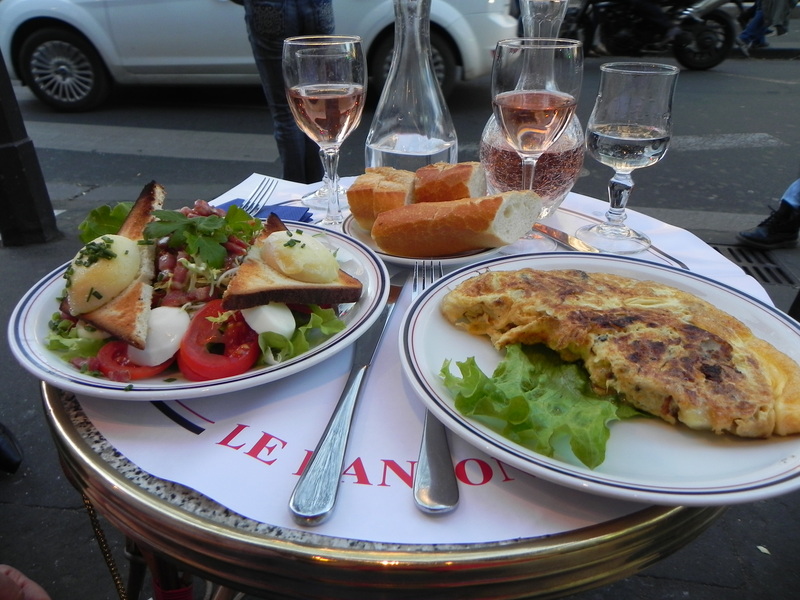 What a lovely way to spend a very cold, wet Spring Saturday morning in DC – reading about your lastest Paris adventure – 14 glasses of wine – la te da!! Hope you have continued fun! Kathryn it was a wonderful whirlwind excursion. It is an official ET strategy to work off the wine through intense shopping-walking. It works in DC too! Julie I need to find out about E. Dehillerin – particularly if you are genuflecing and buying new knives. Sounds like a wonderful store. The 14 glasses of wine is right down my alley. What was the favorite white and the favorite red? I will do a post specifically on our visit, but suffice to say it is a cornucopia of cooking tools piled high on dusty shelves. We became very fond of the Cotes du Rhone roses, and my favourite red is any St Emillion bottle. I think it requires more study though…. Note also that the E. Dehillerin website offers only a fraction of what is available in the physical store – a good excuse for a Paris visit.